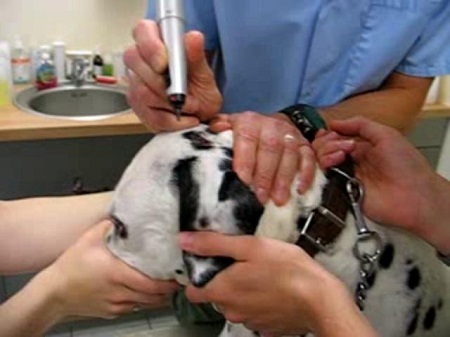 The neoplasmskin s are the most common in the species canine and feline, these may be benign or malignant in origin, the neoplasmmalignant s called skin cancer, may have its origin in the cells Epithelial mesenchymal, linfohistiociticas and cells bear or rarely be metastasis of neoplasms from other locations. As general characteristics we can highlight that appear more frequently in animals over 6 years and there are certain breeds particularly predisposed as the Boxer, Golden retriever, Scottish Terrier, Bull Mastiff, Basset Hound, and others. Skin cancer is a disease in which cellare cancerous (malignant) s in the outer layers of the skin. The skin protects the body against heat, light, infection and injury. Also stores water, fat and vitamin D.
The skin consists of two main layers and various kinds of cells. The outer layer of the skin is called epidermis. It contains three kinds of cells: cells flat in the form of scales on the surface called cellsquamous s; cellround s called cellbasal s and a few cells called melanocytes, which give color to the skin. The inner layer of the skin is called the dermis. This layer is thicker and contains blood vessels, nerves and glandsweat s, cells immune lymphocytes and mast cells. Hair (hair) of the skin also grows in the dermis, in a tiny bag called follicles. The dermis produces sweat, which helps cool the body, and oilwhich prevent the skin from drying out. There are several types of cancer originating in the skin. The most common are the Mastocytoma and s squamous cellcancer. These types of skin cancer are referred to as cancers of the skin, not melanomas. Melanoma is a type of skin cancer that originates in melanocytes. Eye!. There are a variety of non-neoplastic skin tumor lesions (cysts, skin, nevi, Xanthomas, calcinosis cutis) must consider in the diagnostic differential. The appearance of the skin cancer may vary. Example a nodule cutaneous solitary or multiple presentation of cutaneous or subcutaneous location, very variable size, multiple forms and external features very different depending on type of cancer , the most common of the skin cancer sign is a change in the appearance of the skin, such as growth or a wound that does not heal (see etiology). Some neoplasiaskin s adopt ulcerativascomo forms a sore or ulcer (cats, linfosarcoma cutaneous Mastocytoma and s squamous cellcarcinoma,…). Presence of lameness, inflammation and digital pain in dogs of black layer, should make us suspicious of carcinoma of the Subungual bed although the presence of a skin nodule is not obvious. Many times there is diseaseis or symptoms associated as intense itching (pruritus), skin infections (Pyoderma), areas without hair (alopecia), increased size (Lymphadenopathy) and Seborrhea nodes may be associated with some neoplasmskin s.
S vomiting, diarrheas and coagulopathy occasionally in the mastocitomas. Signs related to metastasis in some cases of neoplasmmalignant s.
If the riene mascot a stain or lump in the skin the veterinarian can remove it to analyze the tissue under the microscope. This procedure is known as biopsy. The diagnosis is direct and is based on the results of aspiration cytology or biopsy and histopathology. Treatment for cancer of the skin and of the neoplasm, benign s depends on the type and stage of the disease, the age of your pet and your general State of health. Not all patients are cured with standard therapy; some standard treatments may have too many side effects. Surgery is the most common treatment for skin cancer. The veterinarian can extract the cancer using one of the methods as it is simple division (operation that extracts the skin cancer along with part of the tissue healthy located around this). Therapy of laser beams (This procedure uses a highly focused beam of light that destroys only the cellcancerous s). Radiotherapy is the use of x-rays to eliminate cellcancer s and reduce tumors. Radiotherapy for cancer of the skin is applied by a machine outside the body (external radiation therapy )). L to chemotherapy consists of the use of drugs to delete cellcancer s.
Biological therapy (the use of the immune system of the body to fight the cancer) He is being evaluated in clinical trials. Biological therapy aims to treat the body itself to fight and destroy the cancer. Substances produced by the body itself or manufactured in a laboratory to increase, direct or restore the natural defences of the body against the disease are used in biological therapy. Biologic therapy is also known as the (BRM for its acronym in English) biological response modifier therapy or immunotherapy. The prognosis is excellent in the neoplasmbenign s if excision (removal of the tumor surgery) is complete. Prognosis of carcinoma cellsquamous s: tendency to local recurrence but little tendency to metastasis. The prognosis of the fibrosarcoma has tendency to local recurrence and low incidence of metastases. The prognosis of Mastocytoma: recur approximately 50% of cases despite good surgical technique. The prognosis depends on the degree of cell differentiation, the stage, and chemotherapy adjuvant used. The prognosis of the skin linfosarcoma is fatal. The prognosis of melanoma is highly variable and is not related, sometimes with the histological appearance.